This autographed photo of Fifi D'Orsay scanned from an original in the Northernstars Collection. Fifi D’Orsay started out in life as Marie-Rose Angelina Yvonne Lussier. One of 12 children of a postal clerk, she dreamed of being an actress when she grew up. Educated in a convent, the young Marie-Rose Lussier landed work as a typist in her hometown of Montreal but a chance encounter with the singer Helen Morgan would change her life and make her childhood dreams come true. Morgan, who once sang in Chicago nightclubs and appeared on Broadway in the first production of Show Boat in 1927, was on tour with a stop in Montreal. Their meeting provided the inspiration the starry-eyed Lussier needed. Whether she knew of the hard work that lay ahead or was simply mesmerized by a perception of a life of travel and glamour, the girl who would become Fifi D’Orsay set out for New York. Also see: A biography of Fifi D’Orsay. 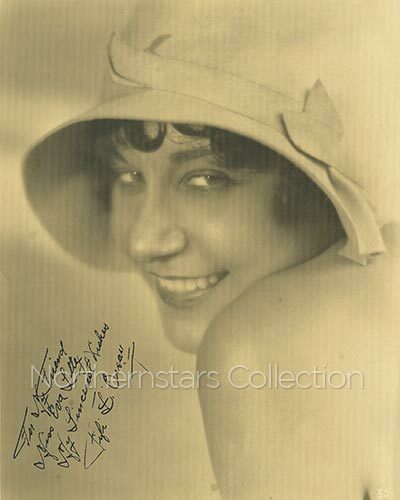 The photo of Fifi D’Orsay was scanned from an original in the Northernstars Collection.